Here's another healthy dosage of retinal photos from my days at work. Again, the white reflections are really just unfortunate camera artifacts. This is a photo of a caucasian female with early dry macular degeneration. 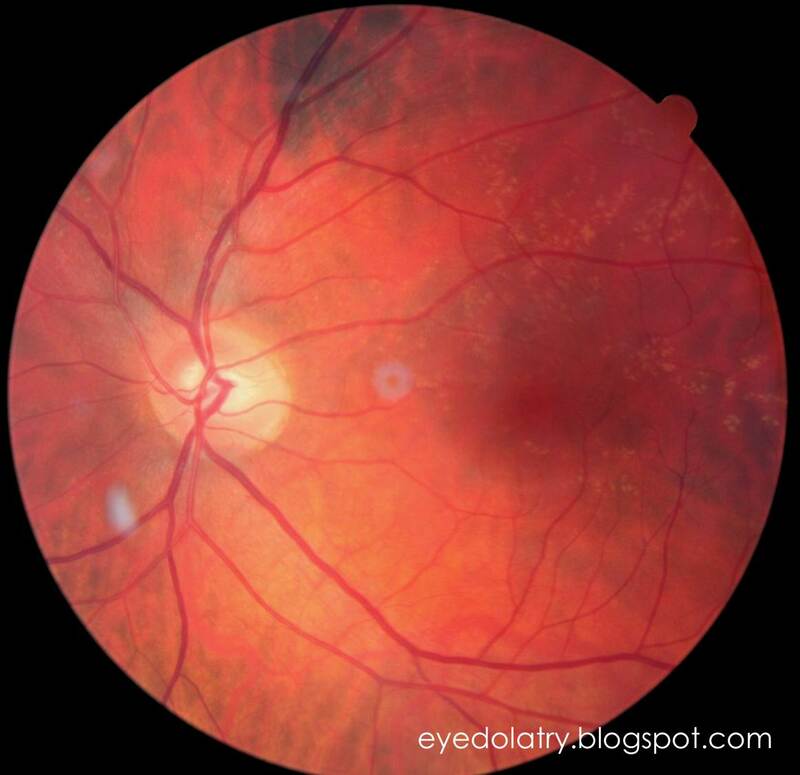 The macula (dark central vision area) shows evidence of 'soft' drusen, which appear as large yellow deposits in the macula in this photo. At this point, her vision is still correctable to 20/20, so we have found the disease in its earliest stages and can hopefully prevent progression. All that blood and swelling in the superior retina is definitely not a good finding. Note how close the bleeding is to the macula. 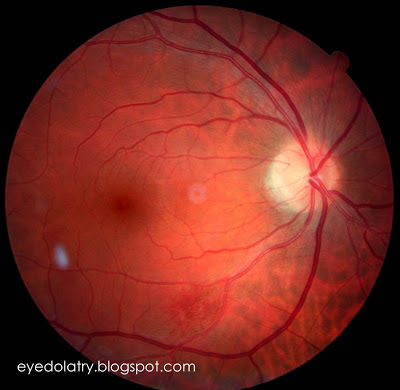 This patient did require ocular injections to treat the residual macular edema. 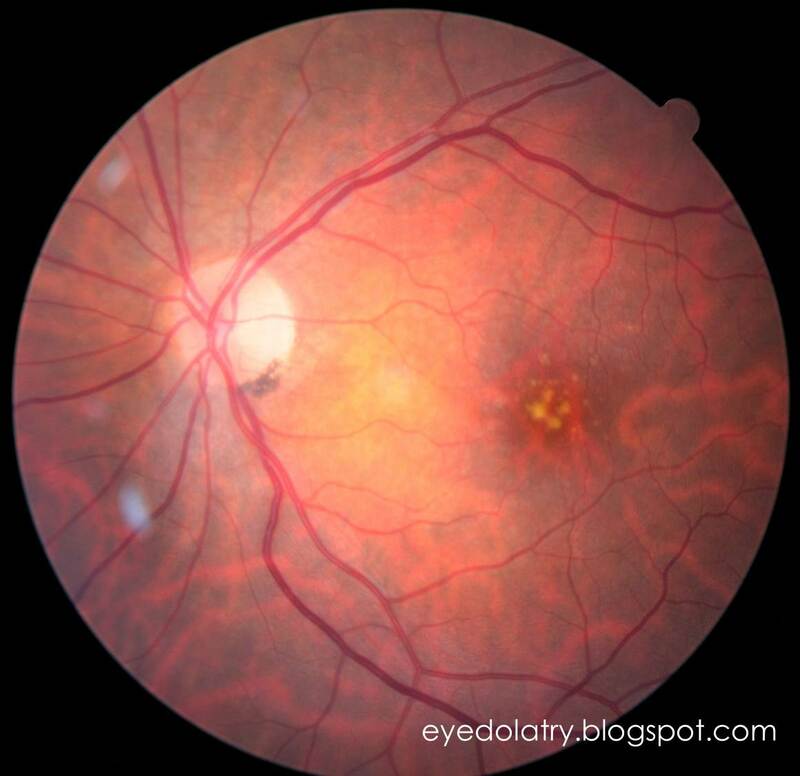 If you look closely at the inferior area of the photo, you can see a faint red area that is really an old, resolving hemorrhage. This patient ended up having normal blood pressure and no other systemic issues, but there was obviously some incident in his past that had damaged the retinal arteriole. Hemorrhages typically resolve in 3 months after their initial onset, and this one is definitely in the process of being absorbed by the surrounding tissue and vanishing. Future photos will likely look entirely normal. High blood pressure or an incident of high strain (like heavy lifting or even coughing) can cause a hemorrhage like this. Two things going on in this photo, but both are normal findings. 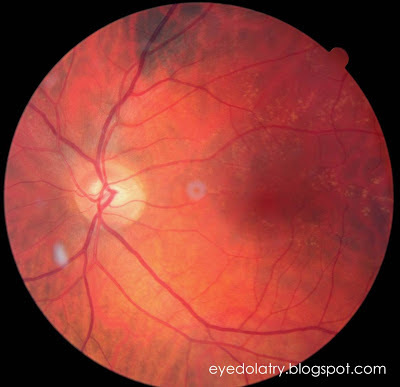 1) The darker area in the top of the photo is a freckle, or technically a "choroidal nevus". These nevi are very common, and unless they show signs of growing or having elevation, are typically perfectly harmless. 2) The yellow deposits are also calcified drusen. 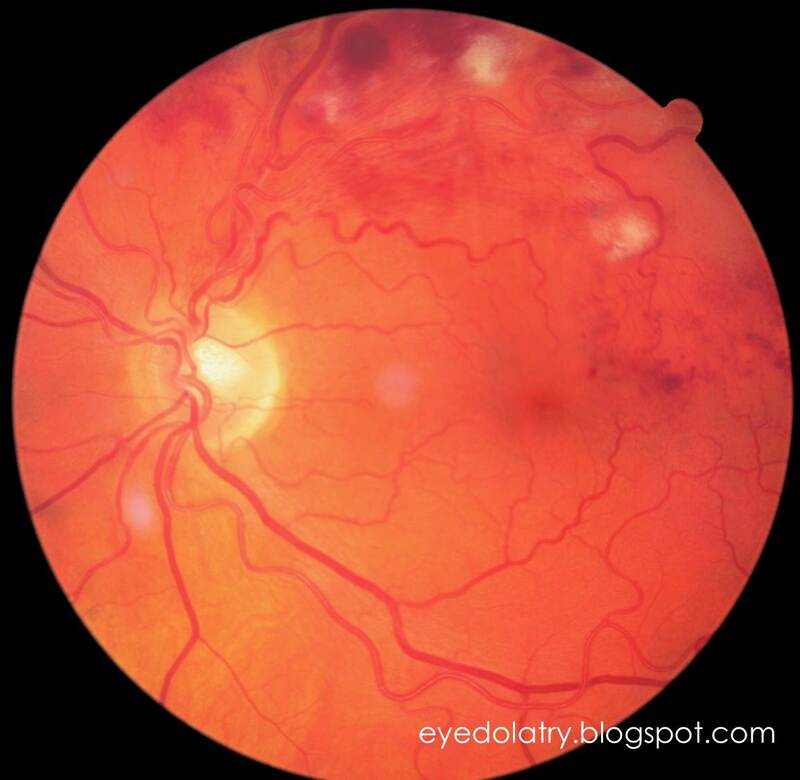 These "hard" drusen are benign, and are typically found in both eyes if a person has them. I always discuss family history of macular degeneration with my drusen patients, but a retina like this is still considered normal.